I thought today I would share with you a few of the stats that we’ve observed from the History SPOT podcast service. 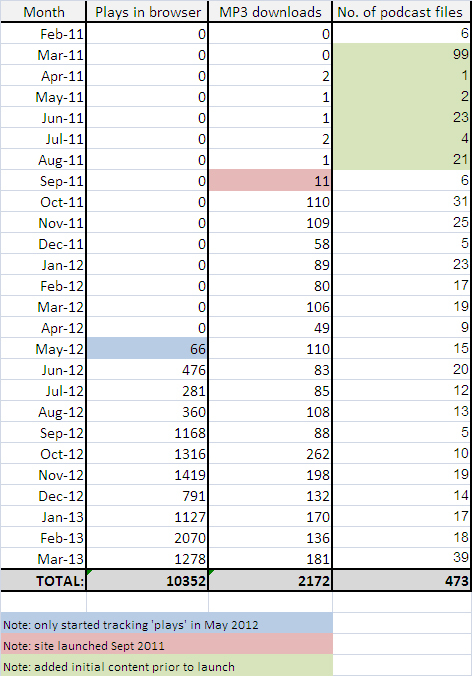 The table below shows how many times podcast files have been played in the browser and downloaded. The website went live in September 2011 but plays in browser are only recorded from May 2012. Nevertheless numbers show an increase that has remained approximately steady since September that year. Downloads tend to range from about 100 to 200 most months. The final column shows the number of podcasts that we have uploaded to the website since its launch (and a little bit before). 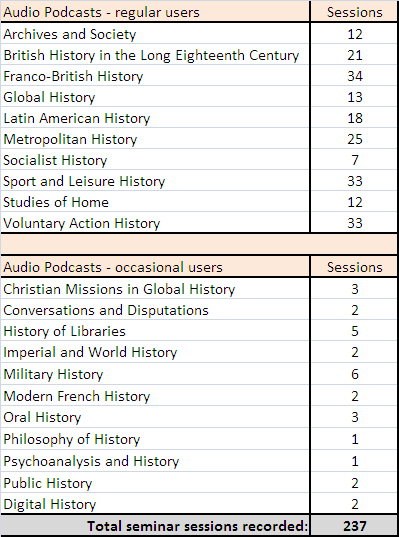 Up until March 2013 there has been 473 podcasts uploaded online, with more following each week. 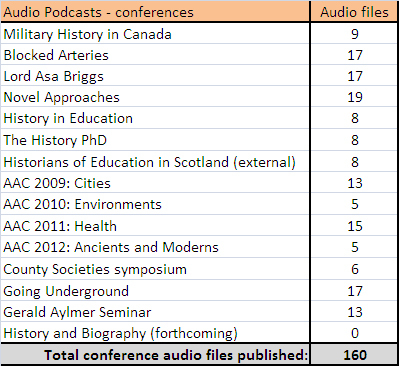 As of today (7 May 2013) there have been a total of 490 podcasts uploaded onto the site. We are rapidly heading toward the big 500! Today we have a new update for you. We are in the process of standardising our own tagging system for the History SPOT podcasts to allow us to create an index for you to find podcasts on your own subject more easily. As we work on this, we have, in the meantime, moved all of the metadata tags into the ‘user tags’ option. This means that all tags related to a podcast can be looked at from any page on the podcast section of History SPOT (just look at the left hand menu). In addition by registering and signing in you can add your own additional tags to a podcast. So if there is something that we have missed, or tags have not yet been added, then you can contribute and therefore increase the discovery of that podcast for other researchers. When logged in all you need to do is click on the tab at the top of the page upon which the podcast is contained (as shown in the image below), and select the ‘Tags’ option. This will take you to the tags page for this particular podcast. Add your tag(s) and click on the Add button. You may add as many as you wish using a coma to separate the items. Tag clouds are a useful way to see at a glance the type of content within the History SPOT podcasts and how many items might contain that topic (the tag appears larger the more often it occurs). To view the entire tag cloud on History SPOT click here. History SPOT UPDATE: Podcasts now freely available! I have some exciting news for you today. In the first of many updates to the History SPOT website that we will be undertaking over the next few months, we have now made available all of our back-catalogue of podcasts available outside of the registration. This means that you no longer need to sign-in to listen to our podcasts. This also means that the IHR have now realised over 200 past events including seminars, conferences, workshops and lectures for free access on the internet (under a Creative Commons licence). These include our Anglo-American conferences, seminars from Voluntary Action History, Sport and Leisure History, and Digital History (to name but a few). This summer, we will be working hard to make History SPOT easier to navigate and access. The site will be more closely linked to our main website (www.history.ac.uk) especially where it overlaps with our research training programmes, and we will be releasing even more content in the form of podcasts, research training handbooks and modules, and a few new features that I talk about a bit more in future posts. For now, though, please do have a look around the podcasts in History SPOT to see what’s there, especially if you haven’t done so in the past. If you like what you see please do register to be able to comment on the podcasts and to access our freely available research training content which includes handbooks on Databases, search engines, and podcasting (with much more to come). Tomorrow I’ll return to discussing our podcasts with a two part blog post about music-making in the time of Queen Elizabeth I. So do stay tuned! History SPOT is a continually evolving platform providing provision of Institute of Historical Research seminars, conferences, and workshops as podcasts or live streams and research training materials as handbooks and online training courses. At the moment we have quite a back-log of podcasts ranging from seminars to conferences which we wish to make available as soon as possible. With the new semester almost upon us and even more events scheduled to be recorded we feel that now is the time to begin to shift through these older podcasts. Over the coming months you will also see an increase in SPOT Newsletter content and its further integration into the podcast pages (where possible). We really believe that History SPOT should not just be a place to upload podcasts with basic metadata attached but a place where the podcasts are one piece of a larger resource. From our end we plan to include opinion pieces, abstracts, bibliographies and links where we can, but we also would like help from our visitors as well. If you have enjoyed a podcast or have any thoughts about them please do post a comment to the relevant page. If you think that additional metadata tags would be useful for identifying the podcast please feel free to add your own (you will find this option as a tab near the top of each podcast page). The more people interact with the resources the more useful we believe they will become. In the meantime please do have a look at our range of latest podcasts freely available. If you haven’t yet please do register for a History SPOT account. Its free, quick to do, and gives you acess to over 200 archived podcasts, related resources, and research training handbooks.